Most are free living, and secrete chemicals in wet conditions that break down organic materials like wood and soil organic matter into molecules that they can use as an energy source. They are called decomposers and are very important in recycling nutrients. Some ascomycetes (mainly disc fungi) are decomposers that form a partnership with algae as lichens that can live in nutrient poor situations like rock surfaces and wood. Other decomposers form associations with plants as mycorrhizae that tap into tree and crop roots. Fine fungal threads can get from soil pores that are too small for other plants and deliver water and minerals to the host plant roots in exchange for energy that the hosts produce by photosynthesis. Recent research has shown that plants in association with fungi and other microorganisms can create soils by creating clay, silcretes and lime nodules..
Slime moulds are not true fungi, but resemble paint fungi. They live as individual cells feeding on organic matter until rain causes them to come together to form a foamy- to powdery mass that develops into wind-borne spores. Did you know that the ancestors of modern fungi living on forests floors across the globe probably originated from deep oceans 2.4 billion years ago? Visible signs of bacteria and viruses are found in plant and animal diseases. a common example is a witches broom distorted plant. Beyond the obvious differences between say, a puffball or a toadstool, characteristics like shape and colour of the fruiting body are often misleading. Unfortunately differing fungi genera can look very similar and the serious identifier has to understand and closely observe differences in size, shape and colour of the parts of a fruiting body, spore colour (spore print). Use the FunKey app. for mushrooms and toadstools. 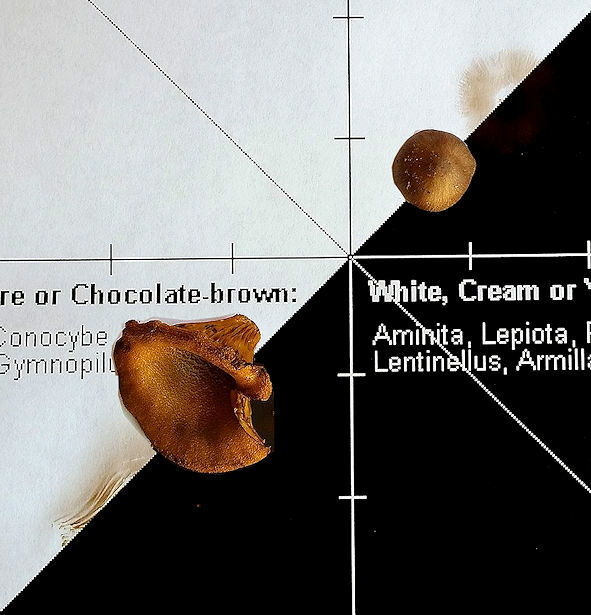 An important tool is the spore print: Place the fruiting bodies on a piece of paper like the one I printed from Wikipedia and leave overnight. You can see by the image that spores drop out to form the patterns of the gills and pores in particular colours. Many developing agaric fruit have a membranous sheet (partial veil) connecting the cap to the stem that breaks to form a ring (that may or may not persist). Some like Amanitas emerge from a egg with the covering called a universal veil. You often have to dig the fruit out to check the base for a bulge or a volva. 3. The Fungimap website very useful. 5. 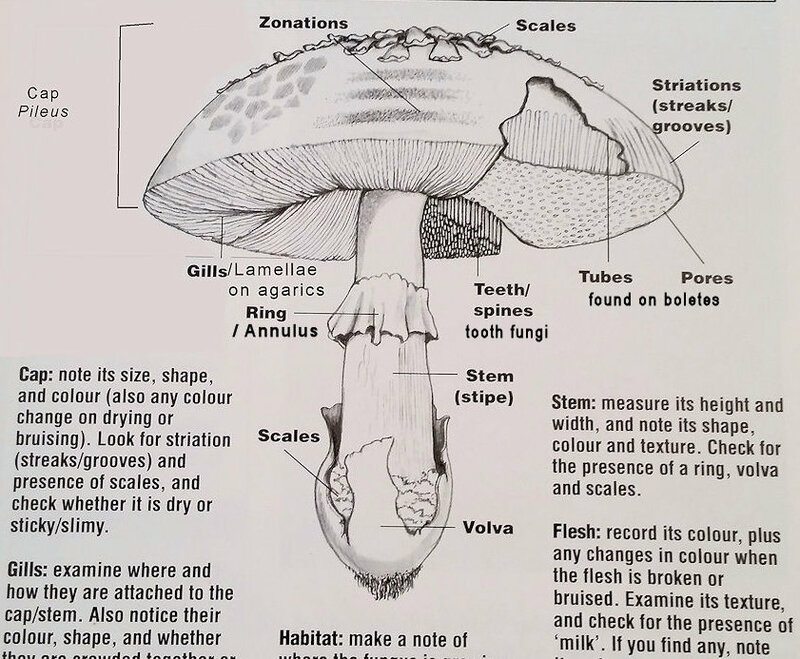 Neil Bougher's pictorial handbook of Perth fungi below is invaluable.